After a few teething problems with my rotoscope projection I need to test paper and refine the working process… All of this gives me more time to get comfortable freehand drawing with the conte and charcoal I’ve chosen to work in. 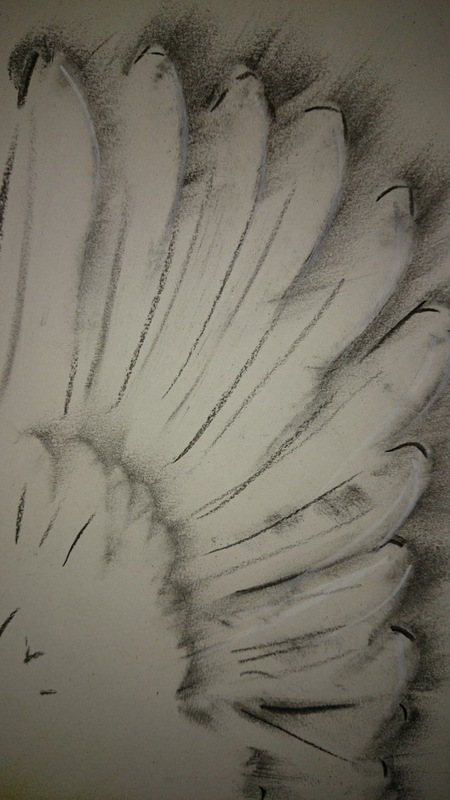 Being extra careful as it’s a messy business, and a smudge in the wrong place could affect the way my drawing looks. I can’t wait to put the animation frames in between, but essentially I am working on the keyframes currently. 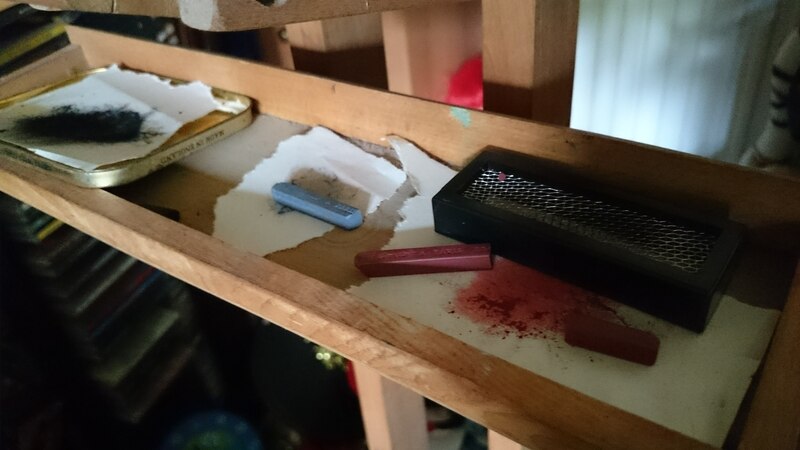 I’m using a small grater to create my own coloured powder as this gives me a little more flexibility to work bit by bit as I could buy charcoal powder, but would probably be tempted to use too much and be too heavy handed with it, but through the testing last night I found that the black conte and the charcoal take to the paper in different ways, I was only able to test 3 of the paper samples as they take a little time to produce. I tried to use the paper samples just in order as they were rolled up so I don’t know which is which yet but here are the first 3 in the paper test set. 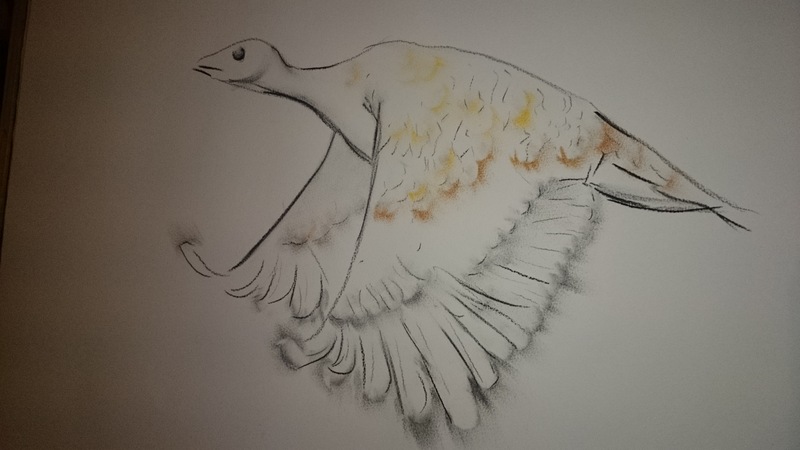 Detail, this is using charcoal dust, charcoal lines and a white conte line to highlight, I also used a yellow conte dust over feather to try and indicate where the coloured feathers of the Bustard are, but it seems a little lost in the final image. 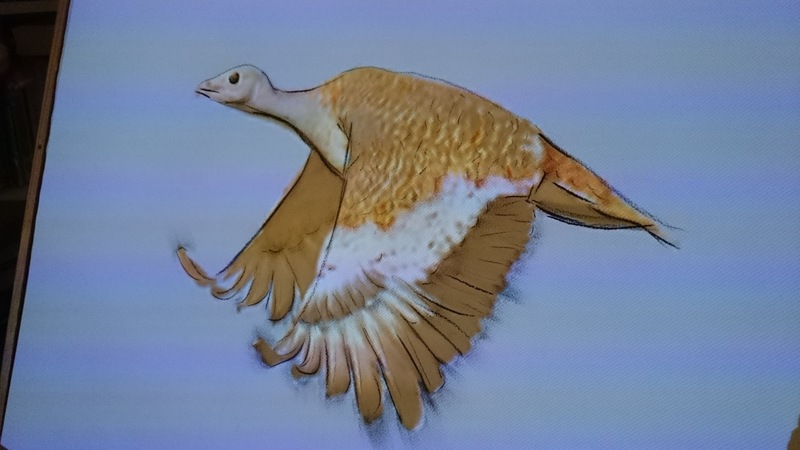 Without projection, this time I added in a few light strokes to indicate the speckled feathers and added yellow conte dust, and some brown dust applied over feathers and this works better for giving indication of the shape and coloured areas. 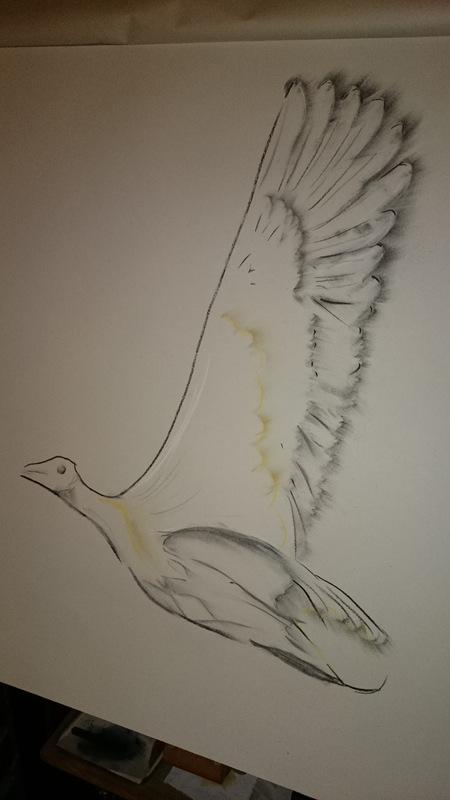 without projection, this paper has a slight cream hue and I tried the white conte for highlight but am unsure as to whether it adds anything, I think the paper would need to be darker… This time I used the black conte dust for the wing tips and it really took well, giving fantastic high contrast. 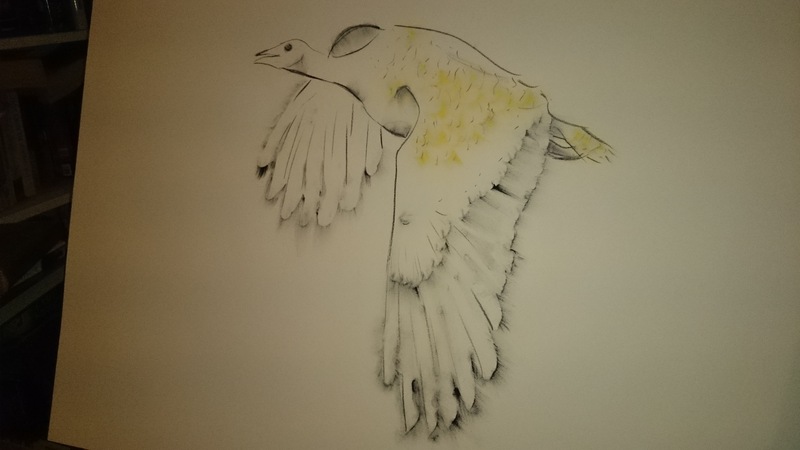 Using the charcoal I was able to smudge for depth in the right places and again the yellow dust over feathers works really well. I was very pleased with this particular combination of marks, but not so pleased with paper choice. 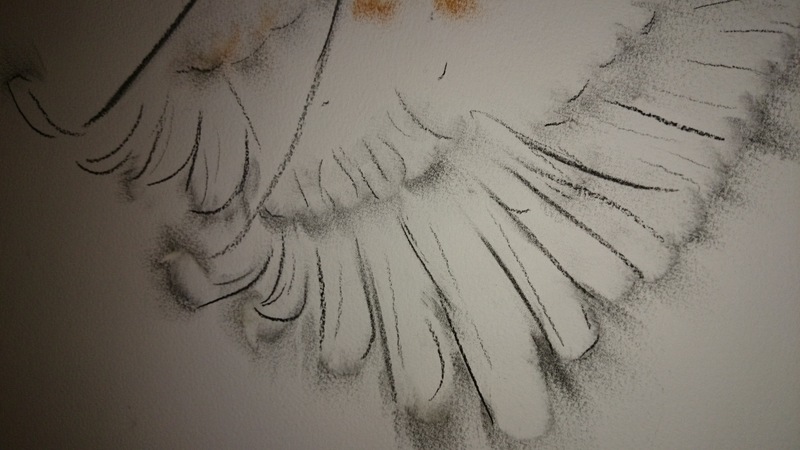 Detail, you can really see how much conte dust works into the edge over the feather here, really good definition. 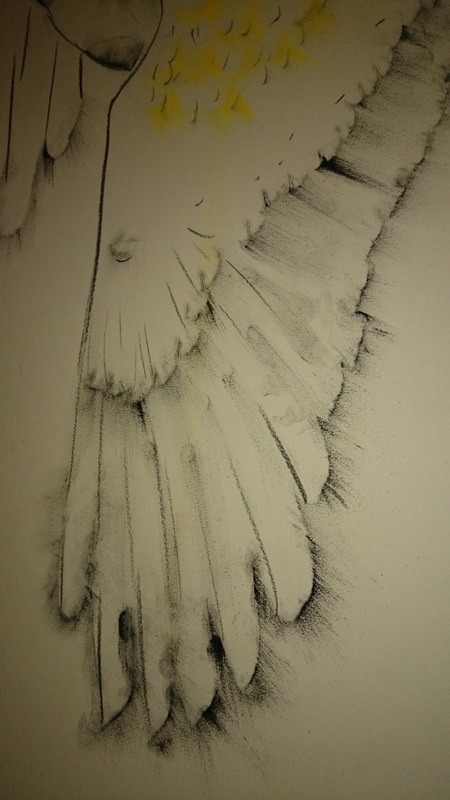 But you can also see a few finger smudges which I need to be careful of. 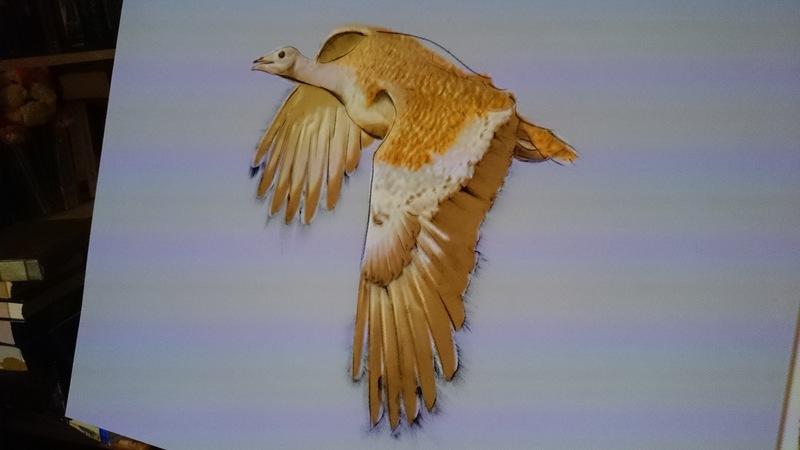 I will test the other 3 paper samples so that I can make a choice, all the time practising and refining my technique and I estimate I will need at least one full movement of flight comprising approximately 12 images for a second of animation. The best of these images I would like to display gallery style as one of my aims was to make a beautiful piece of animation/art. I want to test the keyframes when finished into a very short animatic and see how the lines and marks work when animated, I may need to lessen the swipe length, it may be confusing, at the moment, in my head it looks beautiful! 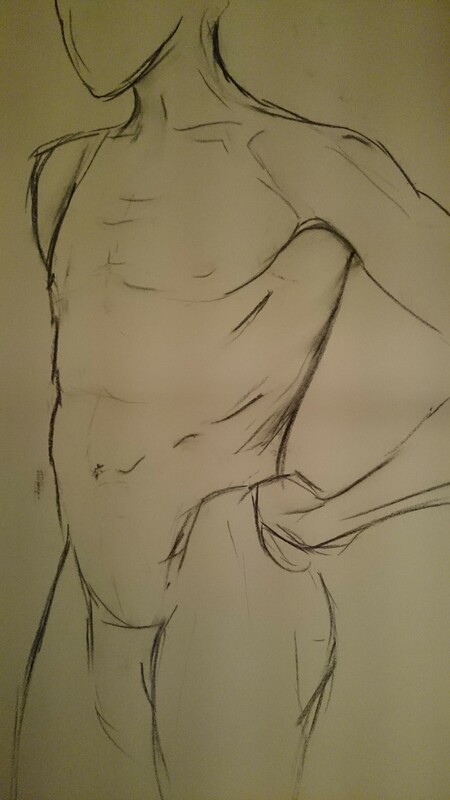 I’m pretty happy with my choice of mark making, charcoal on Newsprint, but I couldn’t miss another opportunity to go to one of the open access life drawing session. 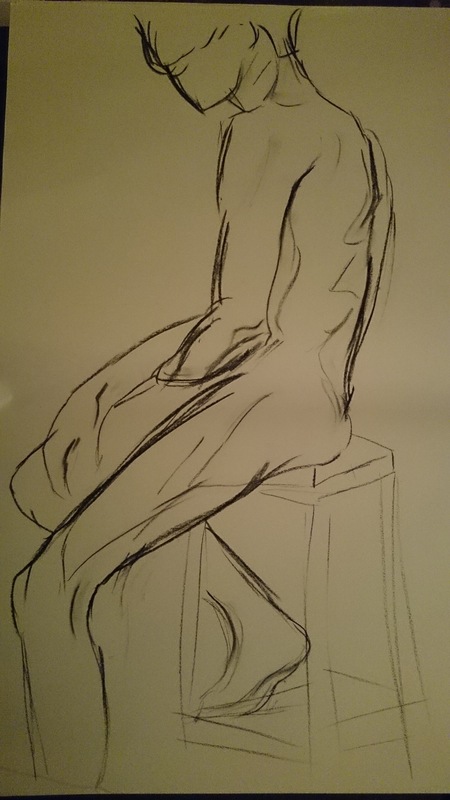 I felt that it didn’t go quite so well as before, but, the quality of line and feel of movement, shape and contour are still evident and this reaffirms my media choice. 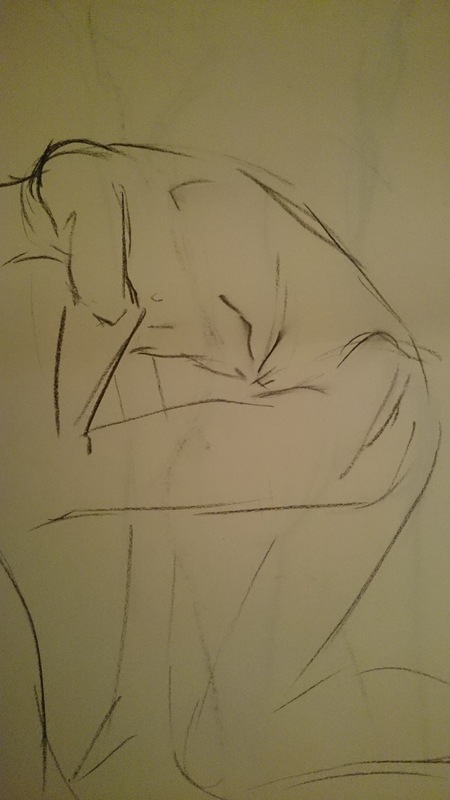 This pose has my favourite type of charcoal mark made, angular, strong, but with a smudge of contour and shape. 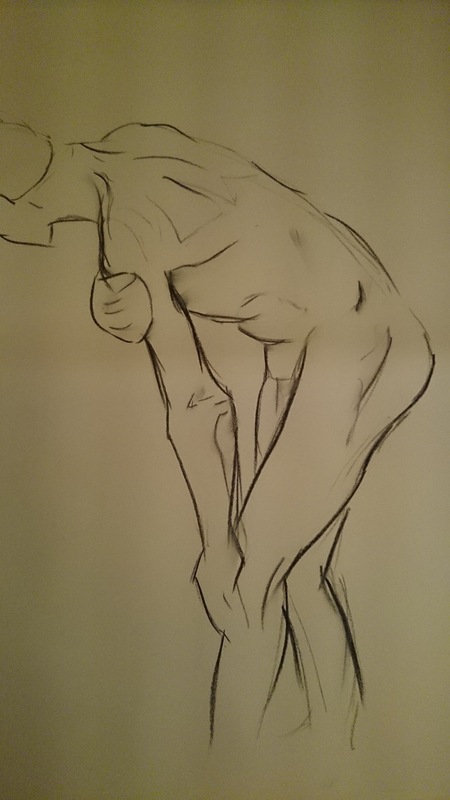 My favourite pose, although a little weak in execution compared to others, it has a nice feel to the shapes and definition. 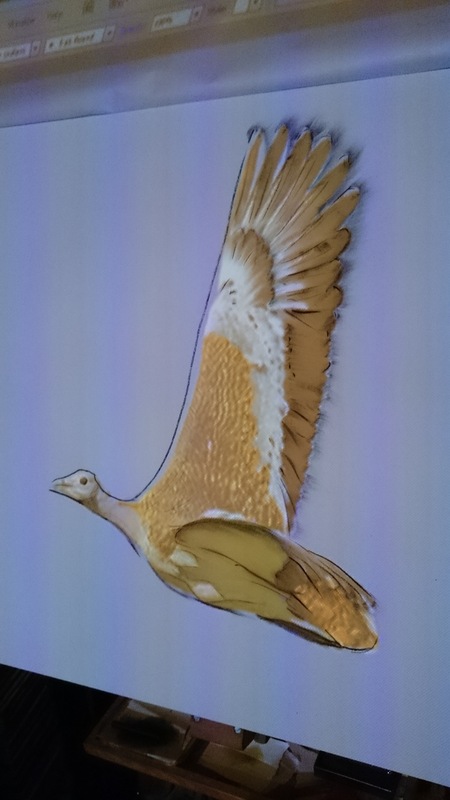 I know need to find some footage of the Great Bustard flying and transpose the technique.